In Upper Egypt, therefore, there is evidence of a belief in the afterlife and an indication that many of the Egyptian animals that were to become dynastic gods were, if not yet revered, at least highly regarded. The Delta, on the other hand, yields the earliest evidence of agriculture and indication of ancestor worship, and here the most important legendary figure of ancient Egyptian history that of Osiris developed. The famous Osiris God myth is believed in its original form to have been devised to spread an understanding of agriculture throughout the land, explained in terms of the death and rebirth of the corn god. Osiris was probably an early leader in one of the settlements of the Delta who had quite a large following. When he died he became identified with the totem of the area which developed, like many other totems, into a harvest god. Osiris God adopted some of the regalia of the older deity including a crown with double plumes and a shepherd’s crook, and the agricultural cycle became his domain. He was revered as a god associated with water and the annual death and rebirth of the land. The Osiris God myth underwent many changes with the passage of time. In one form it relates how Osiris ruled the land justly with his wife Isis at his side. 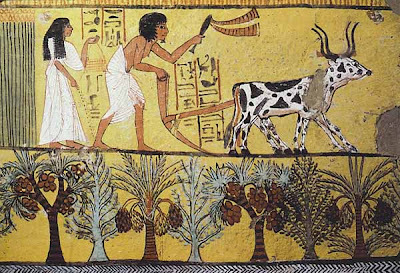 He taught his people, as yet partly civilised, the art of making agricultural implements and controlling the waters of the Nile. He also taught them how to take to a corn diet, produce bread, wine and beer. His wife Isis was equally loved and taught the people how to grind corn, weave linen and, with her devotion to her husband, intimated the benefits of domestic life. Osiris had a brother, Set, who was jealous of his popularity and secretly aspired to his position of favour. Inviting Osiris God to a banquet, Set tricked him into entering a coffin specially designed to fit him alone. No sooner had Osiris obliged than Set hastily sealed it with molten lead and cast it on the waters of the Nile where it was borne northwards by the currents to the marshes of the Delta. Isis, grieved by the news of her husband, set off in search of his body. She cut off a lock of her hair and rent her robes in torment as she went on her way following the course of the river. She eventually found the body entangled in the branches of a tamarisk bush. She extracted it and hid it. Unfortunately, Set was boar-hunting and discovered the body, which he brutally hacked into fourteen pieces and scattered throughout the land. The bereft Isis, this time accompanied by her sister Nephthys, once again set out on her search. They found the pieces of Osiris’ body, carefully collected them and laid them in a coffin, crooning sorrowful incantations over them to make the body whole. It is probable that the concept of Osiris God falling victim to Set was a comprehensible explanation of the fertile land (with which Osiris was associated) falling victim to the relentless desert (of which Set was the chief deity). 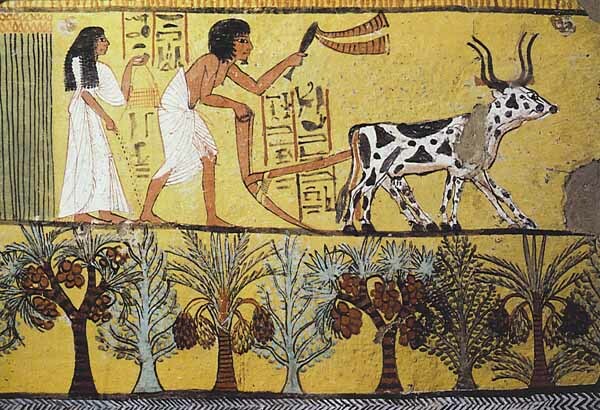 The mutilation of the body of Osiris, the corn god, and the scattering of parts up and down the Nile valley, is believed to illustrate the concept of grain sowing, following which, with the necessary incantations, or rural festivals, the stalks of corn would grow again. Be that as it may, the cultivation and storage of grain was a vital factor in the movement away from primitive society towards civilisation. It was a gradual phase of human development. For the assurance of larger quantities of food and food surpluses led to a decline in hunting as an economic activity. Larger groups of people, not all of whom could be crop-growers, were assured of a regular Egyptian food supply and could settle down. Craft specialisation was a direct outcome, since it absorbed the surplus labour. From the simple technology of the hunters and fishermen we see improved production of weapons, tools and implements and the emergence of new industries including flint mining and flaking.